It’s common to have dry, brittle and dull hair during the winter months and many individuals share stories of specific challenges to maintaining healthy hair. The main causes for dry, breakable hair in winter are related to the combination of indoor heating and cold outside temperatures that lead to the over-drying of hair. Here are a few specific hair care strategies that can help you achieve healthy looking hair during the winter. Hair is more dry in the winter from dry cool air outside and heated dry air indoors. It's possible to counteract these hair moisture reducing effects by limiting excess heat from hair blowers and reducing how often they flat iron their hair. When blow-drying hair, towel or air drying the hair first, and blow drying to style once the hair is at least 70 % dry. Maintaining at least 6 inches distance between the hair and the scalp will limit overly rapid drying. For those who use a flat iron, protect the hair with a heat protector spray prior to flat ironing. Conditioners are important to help protect the cuticle and, in turn, maintain healthy looking and manageable hair. It's important to regularly use a conditioner, and considering alternating their regular conditioner with a leave-in conditioner during winter. If hair dryness becomes a real problem, the use of a less drying sulfate-free shampoo. With attention to various ways to keep our hair looking healthy, it’s easy to forget the health of the scalp. The overall health of the scalp is a key influencer of the quality and health of the hair. Individuals with a dry, flaky scalp will benefit from use antidandruff shampoos. Excessive scalp dryness and flakiness may be related to underlying common scalp conditions such as seborrheic dermatitis and dandruff. It is important to manage these conditions effectively, especially during the winter months. 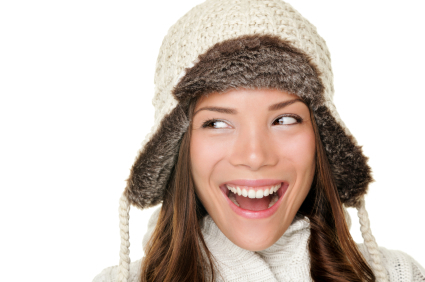 Static electricity and ‘frizz’ are particularly problematic with certain types of winter hats. Wearing hats with a silk or satin lining is ideal as fabrics like wool or cotton have the ability not only absorb moisture, but also increase hair damage from constant rubbing. A variety of ‘anti-frizz’ products are widely available. Limit the amount of alcohol-based styling products as they further promote static and damage susceptible hair. Split ends are common during winter. Despite the myths, the only definitive solution to dealing with split ends is to trim them off. Trimming hair every 6 weeks over the winter to help maintain shiny, healthy-looking and manageable hair. In conclusion, it’s possible to achieve and maintain healthy shiny and manageable hair during the winter. Focus on these five hair care principles to help retain hair moisture and minimize hair damage.